Add MLDb.org to Firefox search bar (beta). 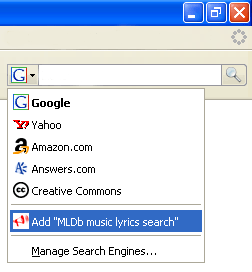 - To add MLDb.org lyrics search to Firefox 1.x click here. Variant 2: Wait until page is fully loaded, then click on the search engine icon to open pop up menu with search engines listed (look at the picture). 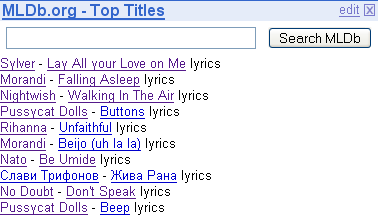 You will see Add "MLDb music lyrics search" entry. Click on it and in a few seconds you will have music lyrics search feature in your browser. To switch back to your previous search engine click again on the search engine icon and choose a search engine. You can change search engine whenever you want. This feature is still beta and it may have bugs. Please contact us if you have any toubles using it. Add MLDb to your Google homepage. If you want to know when new lyrics are added, or you want to keep an eye on top titles then add MLDb plugin to your personalized Google homepage. Add MLDb button to your google toolbar and you will be surprised how many features it has. Clicking on the button when the image is clear will take you to MLDb home page - just like your favorites, but it is more compact. When you type text into the search box, the MLDb button will change slightly. You will see a little magnifying glass appear on it which means that you can search the MLDb database for this text by simply clicking on the button. When you select text in the browser window, the MLDb button will change slightly. This means that you can search the MLDb.org database for the selected text by clicking the button. By clicking on the arrow next to the MLDb button, a dropdown menu will appear. In this menu you will find links to the most important parts of the site. In the near future, many new features will be added to this menu.